Decision makers in health care organizations struggle with how to set priorities for new technologies in medicine. Traditional approaches to priority setting for new technologies in medicine are insufficient and there is no widely accepted model that can guide decision makers. Daniels and Sabin have developed an ethically based account about how priority setting decisions should be made. We have developed an empirically based account of how priority setting decisions are made. In this paper, we integrate these two accounts into a transdisciplinary model of priority setting for new technologies in medicine that is both ethically and empirically based. We have developed a transdisciplinary model of priority setting that provides guidance to decision makers that they can operationalize to help address priority setting problems in their institution. Priority setting is a challenge for every health care system in the world because demand for health care outweighs the supply of resources allocated to finance it. Which programs should a regional health authority fund? Which drugs should be placed on the drug benefit formulary? Which patients should be admitted to a hospital's critical care unit? Which priorities should a research granting body support? There are no widely accepted models for legitimate and fair priority setting in health care to help address these questions. Traditionally, approaches from health economics are promoted as the solution to the problem of priority setting. Health economics provides necessary but insufficient tools (e.g. cost-effectiveness analysis, program budgeting and marginal analysis ) to aid priority setting decision makers. Studies of actual priority setting show that these tools have only limited influence on decision making and the analyses are often unavailable when needed [2–4]. Priority setting for new technologies, for example, is frequently conducted under conditions of varying degrees of evidence about the safety, effectiveness, and appropriateness of particular interventions . Moreover, there is no consensus regarding the values these approaches emphasize (i.e. efficiency) [5–9]. The Institute of Medicine Panel on Cost-Effectiveness in Health and Medicine argued that, "... CEA [should] be used as an aid to decision makers who must weigh the information it provides in the context of ... other values ." Other values important to priority setting include equity, the health of individuals as against communities, the "rule of rescue," and democratic decision making . Unpacking these values helps to clarify choices, but reasonable people, having diverse moral views, disagree about what constitutes a fair allocation of resources to meet competing health care needs. In the absence of consensus on guiding principles, the problem of priority setting becomes one of procedural justice – legitimate institutions using fair processes . Discipline-specific ethical approaches to priority setting (e.g. from philosophy, law, political science, medicine, and health economics) are insufficient because they are not grounded in actual experiences of priority setting in health care institutions and because the values that they contribute to priority setting conflict. Empirical descriptions of priority setting that focus, for example, on considerations of safety, effectiveness, and appropriateness of particular preventive, diagnostic or therapeutic interventions are also insufficient. This is because, though grounded in actual experiences of priority setting, they cannot alone provide normative guidance about what should be done. What is needed, therefore, is a synthesis that incorporates both ethical and empirical considerations. A transdisciplinary model, based in empirical realities of decision making and justified by ethical values, can provide such a synthesis. In this paper, we develop a transdisciplinary model of health care priority setting. Transdisciplinary research – "researchers work [ing] jointly using shared conceptual framework drawing together disciplinary specific theories, concepts and approaches to address common problems" – can be contrasted with interdisciplinary research – "researchers work [ing] jointly but still from a disciplinary-specific basis on [a] common problem" – and multidisciplinary research – "researchers work [ing] in parallel from their respective disciplinary bases to address a common problem" . By integrating an ethically based account of health care priority setting (accountability for reasonableness) with an empirically based one (diamond model) as described below, we have engaged in a transdisciplinary effort. The result is a model because it consists of plausible relationships proposed among concepts and sets of concepts . However, the innovation here is not the resulting model, though the transdisciplinary model is an advance on its parent-models, but rather the transdisciplinary approach to the problem of priority setting. Daniels and Sabin identify two key problems at the heart of health care priority setting: legitimacy and fairness . The legitimacy problem poses the question: under what conditions should authority over priority setting decisions be placed in the hands of a particular organization, group or person? The fairness problem poses the question: when does a patient or clinician have sufficient reason to accept priority setting decisions as fair? An institution's priority setting decisions may be considered legitimate and fair if they satisfy four conditions of accountability for reasonableness: relevance, publicity, appeals, and enforcement (Table 1). Limit-setting decisions and their rationales must be publicly accessible. These rationales must rest on information and principled arguments that fair-minded parties (people predisposed to working together under rules of mutual cooperation) can agree are relevant to deciding how to meet the diverse needs of a covered population under necessary resource constraints. There is a mechanism for challenge and dispute resolution regarding limit-setting decisions, including the opportunity for revising decisions in light of further evidence or arguments. There is either voluntary or public regulation of the process to ensure that the first three conditions are met. Although developed in the empirical context of US managed care organizations, the strength of accountability for reasonableness lies in its ethical roots found in theories of democratic deliberation, grounded in the disciplines of philosophical ethics and political philosophy. These roots connect the priority setting process in accountability for reasonableness with broader democratic processes. The limitation of accountability for reasonableness is that it does not sufficiently explain how an institution might go about operationalizing the model. For example, how should institutional administrators go about putting the relevance condition into practice? Our case study of priority setting for new technologies in medicine in two health care institutions provides a descriptive account of how priority setting decisions are actually made [16, 17]. In the case study, we analyzed documents, interviewed people and observed meetings of groups making priority setting decisions. Based on these data, we developed the diamond model of health care priority setting (Figure 1). Priority setting occurs in an institution with a mandate to set priorities; variations between institutional cultures affect priority setting. Groups of people contributing a spectrum of factors and arguments are involved in priority setting. Factors considered important by priority setting decision makers include benefit, evidence, cost, cost-effectiveness, and equity. Priority-setting decisions involve clusters of factors that vary according to the decision. The previous conception of priority setting as trade-off (eg, equity vs efficiency) was too simplistic and abstract to describe actual priority setting reasoning. 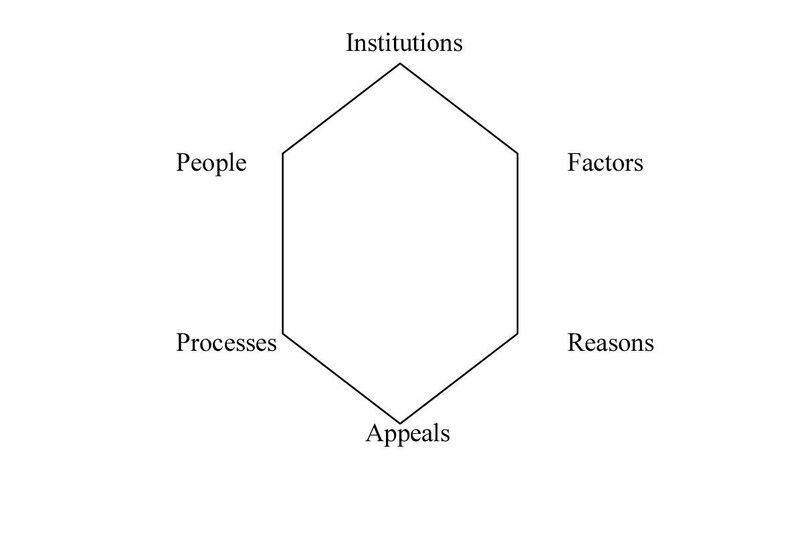 Reasons are assembled by combining these factor-clusters in support of a particular decision. Finally, each decision and rationale is compared with previous decisions and rationales in a casuistry or "case law" that helps to ensure consistency. Priority setting includes certain procedural safeguards such as transparency, disclosure of conflicts of interest, fair access to decision makers, and fair chairing and leadership of the priority setting group. Decisions are open to review based on new information or arguments. The diamond model reflects the fact that legitimacy and fairness are not all or none phenomena. Instead, they lie along a spectrum and priority setting can be more or less legitimate and fair. Much as a gem's flawlessness depends on the flawlessness of its facets, legitimate and fair priority setting depends on the legitimacy and fairness of each of six elements identified in our study. The strength of the diamond model lies in its empirical roots, grounded in the discipline(s) of the social sciences. Because it reflects the realities of actual decision making, it can more easily be put into practice than an ethically based account. The major limitation of the model is that simply because a group makes priority setting decisions in a particular way does not make these decisions "right". An ideal model of health care priority setting will need to specify what should be done (i.e. justified ethically) and how it can be done (i.e. based in empirical reality). By combining accountability for reasonableness with the diamond model, we developed a transdisciplinary model of priority setting that has a solid ethical justification and deep empirical roots so it is more easily put into practice in a particular context (see Figure 2). We integrated these two accounts as follows (Table 2). First, because reasons are central to priority setting, we collapsed together the elements of "reasons" and "factors" in our diamond model into the concept of "rationales" and positioned this as the central concept of the transdisciplinary model. 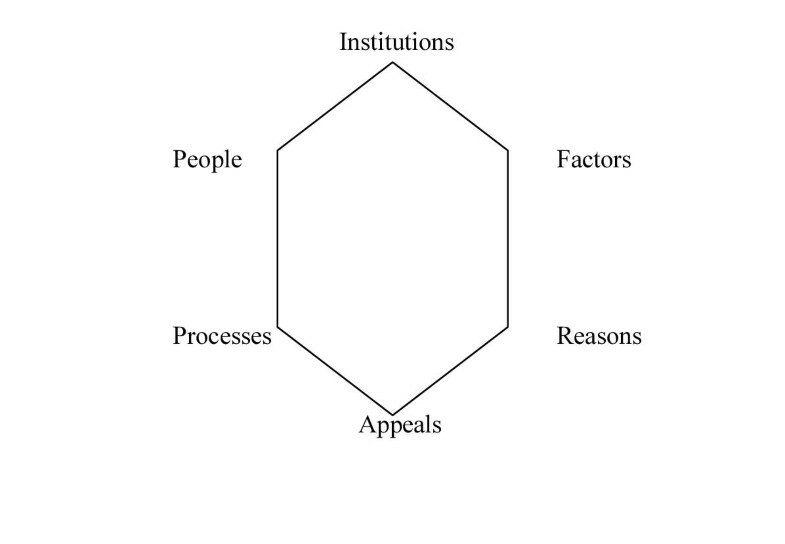 Second, we arranged three elements of the diamond model – processes, people, and appeals – around the central concept of rationales (see Table 2, left hand column), because we discovered that conditions of accountability for reasonableness – relevance, publicity, and appeals (Table 2, middle column) – bound these elements to rationales. Third, we replaced these conditions with operational goals: reasonableness, transparency, responsiveness, and accountability (Table 2, right hand column). Finally, we situated the model in the "institutions" element of the diamond model, which accords with the enforcement condition of accountability for reasonableness, and supports an operational goal of accountability. This new model is a more practical and user-friendly version of accountability for reasonableness that can guide health care decision makers in actual priority setting. There would be constraints in each domain from accountability for reasonableness. 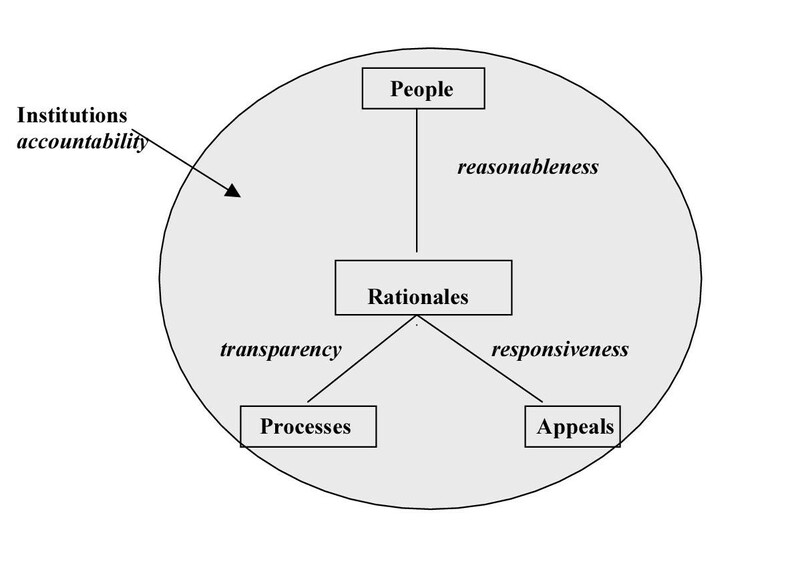 Institutions would have to be duly delegated to make these decisions; people would have to represent an appropriate array of perspectives; the people in the context would have to determine what factors should be included in the rationales; the process would have to make reasons transparent not only to participants but to people affected by the decisions; and appeals would have to be responsive to the rationales. Bring together a committee of fair-minded people to make priority setting decisions. The group should include a broad spectrum of individuals from within the organization, as well as patients and members of the public. They should focus on the reasonableness of the rationales for each decision. Put into place processes to ensure the transparency of the decision making activities (e.g. public notices and town hall meetings) and to ensure that the rationales are widely available. Design methods to hear appeals regarding the rationales for decisions and to respond to further evidence or arguments. Develop mechanisms of institutional accountability to ensure that the first three steps are followed. Although studies of actual priority setting practices are rare, they often resemble aspects of the transdisciplinary model. In the US, accountability for reasonableness was itself developed in the context of private sector managed care institutions and is being applied to pharmaceutical benefit management [18, 19]. In Canada, the diamond model was developed in the context of public sector institutions making decisions about new technologies in cancer and cardiac care. In the UK, Oxfordshire Health Authority has developed a "Priorities Forum" that illustrates many aspects of the transdisciplinary model . There may be differences in how some public or private institutions might go about implementing the transdisciplinary model. Many public institutions are already obligated by law to disclose their decision making practices and outcomes and to include a broad representation of public stakeholders. Adoption of the transdisciplinary model would therefore entail a less radical transformation of their institutional culture and practices than will be the case for many private institutions that have, up until this point, been under no such obligations . Both accountability for reasonableness and the diamond model – and therefore the transdisciplinary model – were developed in the context of priority setting for new technologies. It would be reasonable to expect that the transdisciplinary approach might be more broadly applicable, for example, to decision making about bed closures or space allocation or staffing, or around strategic, capital, and operational planning both at the hospital level and at the clinical level. If this exercise were repeated in different contexts, the resulting transdisciplinary models may very well look quite different. This transdisciplinary model may not be fully generalizable to all contexts, though we expect that it will offer some guidance to decision makers across many priority setting contexts. Priority setting decision makers have had little guidance to help them develop their processes. Traditional discipline-specific approaches are insufficient because they cannot tell decision makers what to do in specific contexts, and empirically derived models of actual decision making are insufficient because they cannot provide normative guidance. We have developed a transdisciplinary model of priority setting that provides guidance to decision makers that they can operationalize to help address priority setting problems in their institution. The project was funded by a grant from the Medical Research Council of Canada/Canadian Institutes of Health Research and the Physicians Services Incorporated Foundation. Dr. Gibson is supported by a Canadian Health Services Research Foundation post-doctoral award. Dr. Singer is supported by a Canadian Institutes of Health Research Investigator award. We are grateful to Solomon Benatar and Norman Daniels for comments, Marc Berger for helpful discussions, and Althea Blackburn-Evans for editing the manuscript.